Automobile industry is one among the various fields envisaging fast development and is having an impact on transportation and thereby the day-to-day life of mankind. The quality and reliability of a product is essential in a competitive world with respect to cost and high life time. The present work deals with a specific critical automobile component, namely, synchronizing hub, which requires stringent quality control. Various types of cracks are found to develop in the component, which may be harmful from application point of view. Hence an inspection methodology is derived so as to ensure 100% crack-free products. The most suitable nondestructive testing method for ensuring this is found to be the magnetic particle testing using central conductor technique with wet fluorescent medium. The component under study is manufactured by powder metallurgy technique and case hardened by the induction hardening process. A study is made to optimize the different machine and testing parameters that could yield the best results with respect to detection of cracks. Synchronizing hubs are used in manual transmission gear boxes for automobiles. They synchronize the process of switching between successive gears. One hub is present between every two gears and upto three hubs are generally required in a vehicle. The hubs are used for a dynamic application, failure of which can cause serious accidents. Thus requiring stringent checks to ensure crack free products. Wet Magnetic Particle Inspection (MT) method was found to be the most suitable method for detection of cracks and the process stage at which they originate. Among the different MT techniques central conductor technique with wet fluorescent medium was felt to be appropriate. When the inspection procedure was carried out with currents recommended by ASTM code of practice there were difficulties in detecting the cracks which were originally present in hubs. This initiated an interest in probing the details of the technique and hence the present work..
Synchronizing hubs used in automobiles have commonly been produced from wrought steel by forging followed by extensive machining. Industry has been looking at alternate processes to reduce extensive machining and raw material costs. Powder metallurgy (P/M) has its ability to produce near-net shape products thus drastically reducing machining operations. It is also a cost effective technique particularly when huge production volume is involved. Hence P/M is chosen as the technology for manufacturing hubs for cars. The basic process typically consists of blending raw metal powders along with any necessary lubricants or additives; filling a die cavity with the blended powder; pressing the powder in a die to form a "green compact" and then sintering at a high temperature to bond the powder particles together and "strengthen" the product. Post-sintering operations are sizing to meet dimensional requirements, followed by machining and shot pinning. The final post machining operation is induction hardening. This is done to provide wear resistance to the hubs. Fig.1 shows both the full view and cut view of one of the three synchronizing hubs used in a car. The part has three levels or steps on the either face viz., the outer skirt with teeth, the middle web and the inner hub. 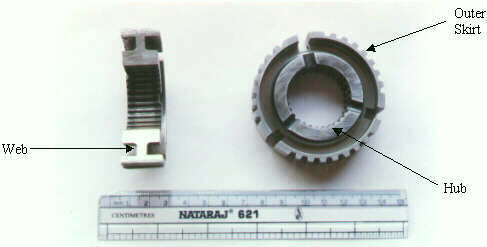 It has keyways, multiple serration and grooves as shown in Fig.1. Because of the complex shape, sharp corners, multiple levels in the product and in addition the large number of processes involved in its manufacture by powder metallurgy route, cracks in synchronizer hubs can occur at any stages from compaction to induction hardening. As the part is used in the transmission of the automobile, the part should be free from any cracks so that it may not fail in service. Hence it is important that 100% of the synchronizer hubs have to be checked for cracks. Keyway corners and splines on the inner diameter, which act as sharp notches, are the most susceptible areas where cracks could occur. Fig.2 shows various types of cracks, which may be present in synchronizer hubs. Keyway cracks (KC): Emerging from keyway corners and extending over the surface or to the other face through keyway slot. Groove cracks (GC): Emerging from splines on the inner diameter and extending over the oil groove. Radial/Spline cracks (RS): Multiple cracks emerging from splines on the inner diameter and extending over the hub. Widely used NDT techniques in industries are ultrasonic testing (UT), Radiography testing (RT), Liquid penetrant inspection (LPI), eddy current testing (ET) and magnetic particle inspection (MT). easy to adapt to a mechanised test system. Hence, in the present work, central conductor technique with wet fluorescent medium has become the choice. where WT and d represent wall thickness of sample and diameter of central core conductor respectively. Currents have been varied upto ± 20% in steps of approximately 10% from the current value given by Equation 3.3. Currents were applied in two shots, approximately 1/2 s each. The appearance of defects is explained in Table 2, along with the details of other parameters, namely, flow rate, magnetic particle concentration and black light intensity used. For the present study, EMCS magnetic particle testing equipment (UFA 242) of Indian make has been used. The equipment has a provision to vary the current in steps of 25A. This equipment facilitates both longitudinal magnetisation and circular magnetisation. The magnetic particles used were iron oxide fluorescent powder (450 mg; 15 to 30m ; Medium ID: MG-OG; Batch No. TR/90 of Ferroflux products of India) in kerosene vehicle. An aperture type demagnetizer has been used for demagnetization of samples after the experiment. Since it may not be possible to present all data collected within the scope of the paper, in all Tables, data for seven different representative samples are shown. In general, the length of KC varied from 2 mm to 35 mm. The GC was of 2 to 3 mm length. Length of RS varied from 1 mm to 2mm. The study was repeated with different concentration of magnetic particle in the carrier/vehicle, namely, 0.3 mL/100 mL and for the same currents of previous trial. The observations are shown in Table 3. The colour of the magnetic particle should be such that it contrasts most with the surface and in our experiment it glows as bright yellow - green when viewed under black light. This yellowish-green colour has better brilliance with the background and also is pleasant for eyes. Particles of smaller size than that used in our experiment may fill the crack and hence the discontinuities may become undetectable. Similarly particles of higher size may mask the finer cracks. Hence experiment was not repeated with other magnetic particles. The entire experiment has been tried at two different flow rates, namely, 50mL/s and 100mL/s while magnetic particle concentration was kept constant at 0.2mL/100 mL. The higher flow rate simply resulted in washing away of all indications for all currents. As per the Standard Practice for Magnetic Particle Examination, SE 709 of ASTM the black light intensity at the examination surface (380 mm from the face of the light lens filter) should not be less than 800 m W/cm2 when measured with a suitable black light meter. In the present study two sources of intensities 1650 m W/cm2 and 4500 m W/cm2 (at a distance of 400 mm from the sample) were used and the experiments repeated for distance range 300 mm to 450mm. The results are shown in Table 4. From Table 2 it is evident that the defects are revealed sharply for the current given by the Equation 3.3 for all hubs while the other parameters being kept constant. Increased magnetic particle concentration results in high powder accumulation and irrelevant indications at change of sections as shown in Table 3. For higher currents complete masking of defects along with irrelevant indication and high powder accumulation is observed. In the present study under the black light source of higher intensity the brilliance and sensitivity of defects were good only at a distance range of 300 mm to 350 mm while for lesser intense source none of the defects was visible for the entire range of distance in which experiment was conducted as indicated by Table 4. At relatively low currents (than suggested by ASTM), at a magnetic particle concentration of 0.2 mL/100 mL, with a flow rate of 50 mL/s and with higher black light intensity the defects are revealed the best with better sensitivity. It appears that separate MT standards may be thought of for synchronizing hubs manufactured by P/M for use in automobiles. The authors are grateful to Mr. K.Mani, President SFL-Hosur for according permission to carry out the work, the encouragement and support throughout the work. They are also thankful to Mr.M.V.Mohan and Mr.R.Vivek of EMCS for the support extended by them. They also thank Mr.V.Srinivasan and other staff of EMCS. One of the authors, B.N.Sankar is grateful to Dr.C.Mohana Doss, Professor and Head, Department of Physics, Anna University for the encouragement given. Appendix - B, Article 7, magnetic Particle Examination, Section V, T 745 1(b) and T 745.2(b), ASME, 1992. Sidney H.Avner, "Introduction to Physical Metallurgy", Second Edition, Tata McGraw Hill Publishing Company, New Delhi, India, pp.605-632, 1997. Article 25, Appendix C, Standard Practice for Magnetic Particle Examination, SE-709, Section V, ASME, 1992.